In this three part blog we sill start to look more closely at the genetics of alcoholism, a subject area slightly neglected so far on this blog site. I have often sat in the rooms of AA and wondered if there are different types of alcoholics. One old timer once said to me there were as many types of alcoholism as there are alcoholics but I disagree with this observation. I do think there are certain types. In fact the “Doctor’s Opinion” in the Big Book of Alcoholics Anonymous mentions various types, however accurate or inaccurate these categories of alcoholics may be. Generally I agree with Cloninger who states after much factoral analysis that there are essentially two types of alcoholics. I think his observations of an alcoholic who is a more anxious type and an alcoholic who is more impulsive, conduct problem-based has been observed very roughly in the many meetings I have sat in over the years. Cloninger states there are two “types” of alcoholics and two pathways into alcoholism; the “externalising”, Type II alcoholics, usually the offpspring of alcoholics which implicates lack of inhibition over impulsive behaviours, sensation seeking, risky behaviours and conduct problems and Type I “internalizing” which is posited as involving affective dysregulation with drinking to medicate anxiety like symptoms – both also posited to be linked to the “warrior” and the “worrier” of the dopamine COMT gene variants, Val158 and Met158 respectively. I am the Type II alcoholic according to this typology. 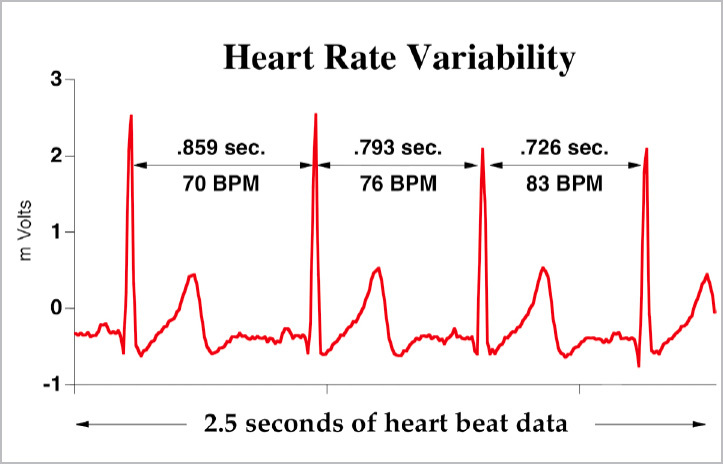 As we shall observe in the next two blogs these gene varients of COMT are linked to emotion regulation – Met carriers are more anxious and do not process emotion as efficiently as Val carriers who are more efficient but more impulsive. Thus their type of emotion processing difficulty appears to result more in impulsive responding, which is as we have seen may be linked to lack of emotion differentiation when labeling emotions, resulting in impulsive decision making. In simple terms Met leads to a slower more rigid responding and Val a quicker responding marked by lack of inhibition over action and behaviour. Two different pathways to the same problem of alcohol dependence but useful to observe in terms of treatment specificity. The role of the COMT gene, implicated in 60% of dopamine metabolism in the PFC, which plays a role in executive function as well as being associated with substance abuse, would be an interesting area to research in terms of genetic vulnerability, particularly as COMT also codes for noradrenaline (NE), another catecholamine involved in PFC and affective regulation. This may be particularly pertinent as COMT has been posited as having alleles responsible for separate functions, cognitive and affective regulation with the COMT Met allele linked to aﬀective dysregulation while the Val allele has been associated with less eﬃcient PFC activation during cognitive control. A recent meta-analysis on fMRI data concluded that Val allele carriers show advantages in emotional but disadvantages in cognitive paradigms while the opposite pattern applies to Met allele carriers (Mier et al. 2010). This trade-oﬀ had been earlier termed the warrior/worrier model (Goldman et al. 2005; Stein et al. 2006). Those with valine (Val158) alleles have increased greater COMT activity and lower prefrontal extracellular dopamine compared with those with the methionine (Met158) substitution. Val158 alleles may be associated with an advantage in the processing of aversive stimuli (warrior strategy), while Met158 alleles may be associated with an advantage in memory and attention tasks (worrier strategy). 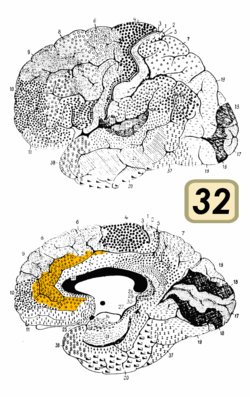 How this latter proposed inhibitory control problems result in impulsivity, sensation-seeking and conduct difficulties that are mediated by family-related factors, including parental substance abuse and chronic early life stress, moderate the relationship between genotype and these observed phenotypes is worthy of investigation and has important consequences for prevention strategies. COMT Val158Met may confer their risk of alcohol dependence through reduced dopamine receptor sensitivity in the prefrontal cortex (PFC) . COMT Val158Met also modulates the effect of childhood adverse experiences on the risk of alcohol dependence, which have been shown to reduce dopamine activity in the PFC and other areas. Citing this study (1) we first we look at how the Met variant (the worrier) is associated with higher rates of alcohol dependence (Tiihonen et al. 1999; Wang et al. 2001) . Notably, Val158Met was recently linked to post-treatment relapse in alcohol-dependent individuals, such that Met carriers were about twice as likely to relapse in the year following treatment as those without the variant (Wojnar et al. 2009). It is proposed that the Met variant could confer increased risk by way of differential dopamine-modulated reinforcement from acute intoxication, diminished ability to cope with negative emotional states and/or deﬁcits in cognitive ﬂexibility and task switching (Bilder et al. 2004; Oroszi & Goldman 2004; Enoch 2006). This study (2) suggests that Met carriers display reduced processing efﬁciency and/or heightened neurobehavioral responses when presented with emotionally evocative stimuli (Enoch 2006; Heinz & Smolka 2006). Accordingly, associations of the Met variant with alcohol use have been speculated to involve motivational pathways speciﬁc to the regulation of negative affect (Bilder et al. 2004; Enoch 2006). If Met carriers show heightened neurobiological responses to cues signalling negative affect and/or diminished capacity to disengage from negative emotional states, these scenarios could potentially increase the likelihood of alcohol use in the context of negative affect, consistent with the current ﬁnding that Met carriers showed stronger associations between implicit coping motives and alcohol consumption. 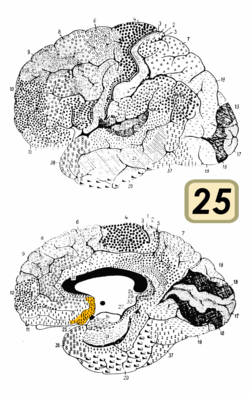 This all ties in with our idea that emotion not processed effectively leads to distressing states which prompts more “implicit” coping or coping activated by implicit parts of the brain which are those of the dorsal striatum which appears to link distress to more automatic (or compulsive) responding to this distress, more so as the addiction cycle progresses. More on the Val warrier next time round. 1. Schellekens, A. F., Franke, B., Ellenbroek, B., Cools, A., de Jong, C. A., Buitelaar, J. K., & Verkes, R. J. (2012). Reduced Dopamine Receptor Sensitivity as an Intermediate Phenotype in Alcohol Dependence and the Role of the COMT Val158Met and DRD2 Taq1A Genotypes. Archives of general psychiatry, 69(4), 339. 2. Hendershot, C. S., Lindgren, K. P., Liang, T., & Hutchison, K. E. (2012). COMT and ALDH2 polymorphisms moderate associations of implicit drinking motives with alcohol use. Addiction biology, 17(1), 192-201. Mindfulness is simply paying attention to thoughts, emotions, and body sensations in a non-judgmental manner.Meditation is a platform used to achieve mindfulness. 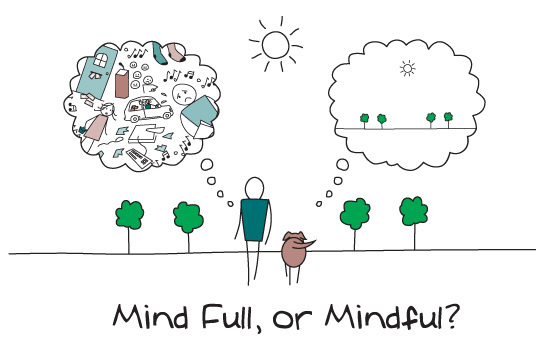 This practice originated from the idea of mindfulness in Buddhism and has been widely promoted by Jon Kabat-Zinn. Although several components for mindfulness meditation have been proposed, four components have found to be common among most: attention regulation, body awareness, emotion regulation, and change in perspective on the self. All of the components described above are connected to each other. Attention regulation is the task of focusing attention on an object, acknowledging any distractions, and then returning your focus back to the object. Some evidence for mechanisms responsible for attention regulation during mindfulness meditation are shown below. Mindfulness meditators showed greater activation of rostral anterior cingulate cortex (ACC) and dorsal medial prefrontal cortex (MPFC). This suggests that meditators have a stronger processing of conflict/distraction and are more engaged in emotional regulation. However as the meditators become more efficient at focused attention, regulation becomes unnecessary and consequentially decreases activation of ACC in the long term. 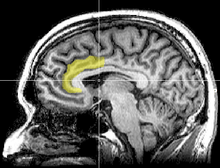 The cortical thickness in the dorsal ACC was also found to be greater in the of gray matter of experienced meditators. Meditators showed a greater cortical thicknesss  and greater gray matterconcentration in the right anterior insula. The insula is responsible for awareness to stimuli and the thickness of its gray matter correlates to the accuracy and detection of the stimuli by the nervous system. Since there is no quantitative evidence suggesting that mindfulness meditation impacts body awareness, this component is not well understood. Cognitive regulation (in terms of mindfulness meditation) means having control over giving attention to a particular stimuli or by changing the response to that stimuli.The cognitive change is achieved through reappraisal (interpreting the stimulus in a more positive manner) and extinction (reversing the response to the stimulus). Behavioral regulationrefers to inhibiting the expression of certain behaviors in response to a stimuli. Research suggests two main mechanisms for how mindfulness meditationinfluences the emotional response to a stimuli. Mindfulness meditation regulates emotions via increased activation of the dorso-medial PFC and rostral ACC. Increased activation of the ventrolateral PFC can regulate emotion by decreasing the activity of the amygdala. This was also predicted by a study in which they observed the effect of a person’s mood/attitude during mindfulness on brain activation. Lateral prefrontal cortex (lPFC) is important for selective attention while ventral prefrontal cortex (vPFC) is involved in inhibiting a response. 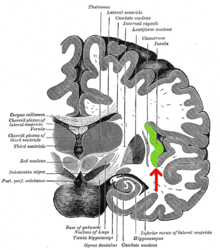 As noted before, anterior cingulate cortex (ACC) has been noted for maintaining attention to a stimulus. 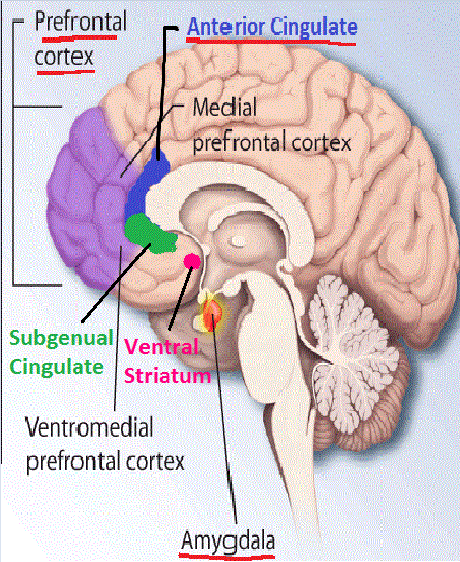 The amygdala is responsible for generating emotions. Mindfulness meditation is believed to be able to regulate negative thoughts and decrease emotional reactivity through these regions of the brain. I have blogged recently about how insecure attachment is linked to various addictive behaviours. What is important is to establish a mechanism by which insecure attachment contributes to later addictive disorders. It may not be enough to say attachment and addiction are linked but that they are linked via a pathomechanism of some sort. I have argued many times before that I believe this pathomechanism, the mechanism by which a pathological condition occurs, or the mechanism that drives a disease state (or disorder) is emotion processing and regulation deficits. We look here (1) at a study that demonstrates how insecure attachment correlates in alcoholics with difficulties in emotion processing and regulation difficulties. I believe this is how addiction is driven to it’s endpoint of chronic, compulsive behaviour, although this study is only a correlational study and makes no such claims about causation. “Attachment theory has been conceptualised as an affect regulation theory, proposing that attachment is associated with the expression and recognition of emotions as well as interpersonal functioning… the objective of the present study was to investigate potential associations between attachment, Negative Mood Regulation (NMR) expectancies, fear of intimacy and self-differentiation…(with) findings support broad attachment theory suggesting that attachment is associated with and predicts affect regulation abilities, difficulties with intimacy and intrapersonal as well as interpersonal functioning in a sample of substance use disorder inpatients. with a significant caregiver is essential for the development of internal working models for communication, regulation of emotions and interpersonal behaviour. and a higher capacity for intimacy, emotional awareness and empathy. intimacy or rejection, to ease pain, anger and ambivalence and possibly establish a “secure base”. Negative mood regulation (NMR) expectancies are beliefs regarding a person’s ability to terminate or alleviate a negative mood state. High NMR presumably reflects the ability to cope successfully with bad moods, whereas having low NMR may lead to less efficacious or maladaptive ways of coping… high NMR may be associated with secure attachment, as securely attached individuals tend to seek comfort from others when emotionally upset, and utilise constructive coping mechanisms to decrease the intensity of distress. By contrast, low NMR may potentially be associated with anxious attachment as well as substance abuse...insecure attachment is a fearful attachment style characterised by a fear of intimacy and rejection, high emotional reactivity and a self-belief associated with being deserving of rejection. Some have argued that fear of intimacy (FIS) is associated with mental health issues and substance use problems…FIS research to date has largely reported significant associations with loneliness, lack of self-disclosure, low social interaction and low relationship quality. self-differentiation experience higher levels of chronic anxiety, emotion regulation difficulties, mood disturbances and substance abuse. potentially inform the development of future treatment approaches. The results (of this study) indicated a significant negative association between anxious attachment and NMR…suggesting that anxious attachment may be associated with lower abilities to regulate one’s negative moods. This is in accordance with other research evidence suggesting that insecurely attached individuals tend to show poor affect regulation. attachment is related to difficulties in intimacy and interpersonal functioning, in accordance with previous evidence that reported a significant association between insecure attachment and relationship problems as well as lower levels of trust, interdependence and commitment. The present investigation also found that anxious attachment significantly predicted emotional reactivity (ER). The above sounds so familiar, doesn’t it? Sounds like most newcomers to recovery that I have ever come cross, including me. 1. Thorberg, F. A., & Lyvers, M. (2009). Attachment in relation to affect regulation and interpersonal functioning among substance use disorder in patients.Addiction Research & Theory, 18(4), 464-478.